Casimer J. Zalucki, 94, of Schenectady, New York passed away peacefully on February 1, 2019. He was born in Schenectady, NY and was the son of the late Antoni and Anna Zalucki. He graduated from Mont Pleasant H.S. in 1942. He served in the U.S. Army during WWII from 1943­-45. 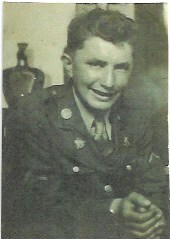 Mr. Zalucki was a member of the 30th Infantry Division. He was a recipient of several medals including the Bronze Star and Bronze Star Cluster, which were awarded to him for heroic achievement. Mr. Zalucki drove his army vehicle along an exposed route under enemy observation to repair a break in wire communication while in Germany. An enemy tank opened fire wounding his two comrades. He bravely gave aid to them and carried the men to his vehicle. Although enemy fire was concentrated on him, he courageously continued onward to an aid station. He also received the Purple Heart Medal and was a POW in Germany in October of 1944. After his honorable discharge in 1945, he worked as an electrician for the General Electric Company retiring after 40 years. In his earlier years, he enjoyed gardening and attending the races at the Saratoga Race Course. He loved to study the horses and jockeys and was often very successful. He was a very honest and compassionate man and enjoyed spending time with his family. He was a member of the Church of St. Adalbert. He was predeceased by his loving wife of 45 years, Helen Zalucki. In addition, he was predeceased by his brothers Stanley, Joseph, William, John and Edward Zalucki, and sisters Celia Samelski and Jane Rutkowski. Casimer was the loving father of Karen (Paul) Emigh of Rotterdam, NY and Paul Zalucki of Colonie, NY. He was the cherished grandfather of Kristina Zalucki of Schenectady, NY and Tyler and Adam Emigh of Rotterdam, NY. Casimer had a wish to be able to remain in his own home during his later years. Thanks to his family and special caregivers, he was able to do so. Mission accomplished, Dad! His family would like to give special thanks to Stasia Pittman, Joseph Vitus, Lucy Freeman and Tawana McNeal­Boston who cared for him like a member of their own family. They would also like to thank Dr. Julie Phillips and Kathy Mathieu, RN of the VA Home Based Primary Care Program for their compassion and care. Funeral services will be held on Thursday, February 7, 2019 at 10:45 a.m. from the DeLegge Funeral Home, followed by a Mass of Christian Burial, 11:30 a.m. at the Church of St. Adalbert. Interment will be in St. Adalbert Cemetery. Calling hours will be held on Wednesday, from 5-7 p.m. at the DeLegge Funeral Home. Day Hab Program, 314 South Manning Blvd., Albany, NY 12203.